Soljund's Sinkhole is a moonstone ore mine east of Sky Haven Temple. The mine is infested with draugr and the miners outside would like someone to drive them out. There are two areas located here: the mine itself and the miner's house. Outside the mine there is a smelter beside a tree stump that has a patch of mora tapinella fungus growing on it, and to the northeast there is the miner's house. They have a Reach Hold guard in attendance, but Perth is waiting for the jarl to send men to clear out the draugr that infest it, though he has given up hope of that ever happening. He will however buy any moonstone ore you have. In the rocks above the mine there is a tree that is growing out of the middle of a solid rock, but there are no plants that can be harvested for alchemical ingredients in the immediate vicinity. The mine is fairly small, spanning just two caves infested with a few fairly weak draugr. However, you will find it has broken through into a draugr catacomb. You will have to jump in and find an alternate route back out. The draugr in the catacomb are more powerful than those in the mine. Upon entering you will find that it is sporadically lit, so a light source or spell is recommended to those without any form of night vision. There are quite a few pickaxes and barrels and sacks of food found throughout the mine. The entrance tunnel descends to the north. At the bottom is a T-junction with several bales of straw in front. To the west is a cave containing three draugr, one at the bottom and two further up an earthen ramp near some wooden planking. There is a moonstone ore vein on the ground to the right as you enter, with a bucket containing a rock warbler egg in front next to some barrels. To the south is a second ore vein on the ground near a table that has a potion of minor healing on it. Behind the table is the earthen ramp leading up to a raised platform with a straw bale and table on top. On the bales is a piece of moonstone ore, with two more pieces on the table along with a bottle of Nord mead and a copy of the Light Armor skill book Jornibret's Last Dance. To the east the tunnel then turns to the north before opening out into a cave with the sinkhole in the middle where the floor has collapsed through into the ancient catacombs, with another ore vein on the ground on the right as you enter. The only way forwards is to drop into the hole, where there is a beam partway down that can be used to arrest your fall and avoid injury. Upon dropping to the bottom, two upright sarcophagi against the south wall will burst open and two draugr will attack and be joined by a third leveled draugr from the north. There is also a dead Breton lying at the bottom of the sinkhole among the rubble and an urn and burial urn against the east wall. Beyond a pair of doorways to the north, there is a cave-in to the west and a corridor into the catacombs heading east. Any noisy fighting will alert another leveled draugr to your presence. At the end there is a doorway to the north, with a random potion in alcoves on either side. The room ahead has a lever in the center with two more, one on the wall to the east and the other on a wall to the west, with a gated doorway to the north. Beside the lever to the east is an alcove with a dead draugr laid out. Activating the center lever will trigger a poison dart trap, while pulling both of the other levers will raise the gate and allow you to proceed. Beyond the gate is a wooden spiral staircase climbing up one floor to a corridor heading west that is trapped by a pressure plate in front of an iron door. The plate triggers a spear trap from the side walls. If the trap is triggered this will alert a leveled draugr in the room through the doors. This next chamber has a central rectangular pool with steps down into it on all sides. There is a long stone table to the north of it, with three dead draugr, a few burial urns and a salt pile on top. The wall to the north has two upright sarcophagi against it, which will burst open releasing two more draugr to attack. To the south of the pool there is a smaller stone table with a giant's toe, a Falmer ear, a bottle of alto wine, a bowl of frost salts, three bulbs of garlic and a leveled healing potion on top, among loads of candles on stands. There is also a food barrel and a burial urn beside the table, and a flooded hole in the floor to the west. Against the south wall is a set of shelves holding two ingots of refined moonstone, a random pair of gauntlets, a skeever tail, a copy of a rarer book, five common books and (if you have reached level 24) there is a copy of Boethiah's Proving which will initiate a quest to find the Sacellum of Boethiah. To the west there are a double wooden door with an urn to the right and a set of shelves to the left holding two more common books. Diving into the hole west of the table allows you to access a flooded chamber under the floor, with an unlocked chest a few paces to the north of the hole, in an alcove to the west. The double doors open to reveal a flight of stairs leading up with a pressure plate in front that doesn't appear to trigger anything. At the top of the stairs, by a broken urn there is a small tunnel to the west and a slightly larger one to the south. The tunnel to the west is quite short and opens into a corridor with a doorway to the north into a chamber with a chest on a raised section flanked by more candles on stands. It is not locked or trapped and contains minor loot. The tunnel to the south is much longer and it twists and turns before opening out into the final chamber. There is a balcony to the south and east, while the final boss (a high-level draugr or even a dragon priest) is around the corner to the west behind an altar. They are flanked by two statues. The one to the left will periodically glow red and shoot a firebolt at you regardless of whether you are sneaking and undetected, while the one to the right will glow green and heal the draugr. This can lead to a difficult fight. Once the draugr is defeated the statues will stop glowing allowing you to explore the chamber. There is a moonstone ore vein to the right of the balcony on the south wall, and another on the north wall, to the right of the altar. On the altar there is a ruby, an ancient Nord war axe, a taproot, a sample of scaly pholiota, a bowl of bone meal and one of spriggan sap, while behind the altar is an unlocked boss level chest. To the left is an earthen ramp leading up to the balcony above the chamber. At the rear of the balcony is a sideboard with a random enchanted weapon, a briar heart, and a sample of hagraven feathers. Northeast of the sideboard is an urn beside a tunnel, but if you head north along the edge of the balcony there is a second large urn. The tunnel takes you up to another ledge above the top of the sinkhole giving you access to the mine and the exit. If you want to maximize the amount of moonstone you get from this mine, you'll be better off if you don't finish the Soljund's Sinkhole quest. If you clear the mine and finish the quest, you can mine 15 moonstone ore every 30 days afterwards. If you don't clear the mine and simply stick to mining the three ore veins that are accessible before you jump down the sinkhole, you can mine 27 moonstone ore in 30 days instead. The mine is not clearable as none of the draugr are marked as the boss. The draugr respawn, making the quest repeatable and possibly killing the miners should you enter while they're at work. 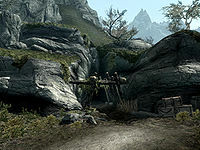 The guard at the mine will always be an Empire-affiliated Reach Hold Guard, due to SoljundSinkholeLocation missing keywords for changing the garrison if the Stormcloaks take the Reach.